As many of you know, I am planning the upcoming Soli Deo Gloria retreat. In His amazing grace, I have finally been able to put together all the speakers that will join us that weekend in October. A few months ago, you got to meet Jennifer. Now, I would like to introduce to you my friend Annie. Annie and I attend church together and she was instrumental in the calling to be of s(He) Listens Ministries. At the retreat she will be talking about her own risk-taking adventure on the bus routes of Austin...which God turned into a book -- a book that you can win. 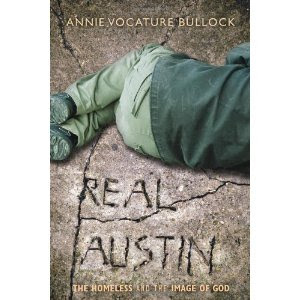 If you would like a chance to win Annie's book, Real Austin: The Homeless and the Image of God, tell me you liked her author page on FB, which you can find here. I love Palm Sunday. I love that we start our church service outdoors and I love the way the service takes us from joy to sorrow inside just a few minutes—from receiving our palms to hearing the story of Jesus's suffering and death as we head toward Easter. Palm Sunday reminds me again how capable I am of praising Jesus and then cursing him. How quickly I turn away from him. How easily I stray. How often I fail and make a mess of things. How very much time I spend in sin. I love this reminder because it draws me back to the sweet sorrow of weeping over my sins. That may sound strange but like Good Friday and Easter, joy and sorrow go hand in hand. They can't be separated. We can't know the joy of grace unless we face the reality of sin first. Self-examination and confession can be bleak but we are not left without hope. There is nothing better to me than the bitterness of sin swallowed up by a fresh wave of grace. stray dogs. I look past them like so much trash. In short, I am revolted by them. Under the influence of my visceral response, I am unable to treat them with anything like the dignity they deserve. This is the ugly truth about me and my failure to love them the way Jesus loves them. It's not the whole story, though. On the other side of confession is forgiveness. Just beyond the bleak picture of how heartily I've failed, there is hope. There are signs of life in the moments of connection I have with the homeless when I see the real truth about their humanity. When I cooperate with the work of the Holy Spirit, I shine through, more human than I am in my sins. I am more myself, more truly reflecting the image of God. I am all of this through grace. These are the things I wanted to write about—the darkness of sin and the lightness of grace—in the hopes that others might find hope in the journey. We can't avoid confronting our sins. We can't merely wave a hand at sin in the abstract or assent to our status as sinners intellectually. We have to know in our guts all the ways we sin day in and day out. But if we stopped there, we'd be dead in our sins. We also have to know in our guts that there is more to us than our sins. easy and all it takes is naming your sins and, through grace, going on to do what is right in Him. Every day, make a new beginning. Annie is graciously giving away one of her books, which you can win by liking her author FB page (please tell me you did this in the comments) and answering this question: What risk might God be asking you to take today, or in the near future? Hi Annie! So nice to meet you. I just commented on a friend's blog, that sometimes I think the whole purpose of Lent is to fail, miserably. No matter how hard I try to prepare for Easter, no matter how disciplined I plan to be, my best efforts fall short and bring me to the place of confession and repentance--of learning again how desperately I need the cross. Sounds like you've got an amazing story to tell. Thanks, Jen, for the introduction. Thank goodness for grace. I also wrote on Palm Sunday and how waving our palm branches is sometimes a sacrifice. And sometimes it just doesn't happen. That is where forgiveness and grace comes into play. I'm excited for your retreat, Jen. I know God has already been blessing it and will continue to do so. We can't know the joy of grace unless we face the reality of sin first. So true! I love basking in grace in the light of my ugly sin. Thanks for the post! "the sweet sorrow of weeping over my sins" - - this is beautiful! so glad to "meet" you Annie! Annie, Annie, I can tell I like you already. What a cool idea for a book. Hmmm, a risk God is asking me to take? Probably to be more vulnerable. I'm not sure I'm taking him up on this risk, but I'm just saying! Jen ~ I have a question. The last few weeks I have not been able to comment on any posts on Soli Sisters if they are word press. Is anyone else having this trouble. I can write the comment, but when I publish it, it goes to a registration and asks for a pass word. I have never seen this before. Any one else? I love the reality of looking at ourselves are realizing that we are more than our sins. We need to acknowledge our sins, but we also need to know we are more. I am adding Annie's book to my Goodreads list. Nice to meet you, Annie. I love your honesty and the way it makes me look a bit harder at myself. Thanks for setting the tone for this holy week. Blessings to you! Yes, thank God for His sweet, amazing grace. God is asking me to continue forward with writing and pressing me to keep growing, even when the stretching is uncomfortable and the road is hard. It seems a greater risk, though, to choose to stop the journey. The stakes are way too high to quit. Nice to meet you, Annie. Your book sounds really good! I am adding it to my list. Okey-dokey - I "liked" her page...and since Austin is my birthplace (born & raised there, for 22 years), I'm stoked to hear about this book!! Because yes - God is calling us into some serious risky territory. Spent last week serving at the Manuelito Navajo Children's Home. So much need, so much hope, so much pain. We're going back for the month of June, to help with their new summer-school program for the children. It's not easy or comfortable. Definitely messy. Sweaty. Stinky. May He bless many in the reading of your book. Definitely "liked" your author page! Glenda, yes, there's been glitches with Wordpress in the last couple weeks. They've straightened out some of them, but you're definitely not alone! Oh yeah, I like you all right! On this journey to the cross this week, I feel the weight of my sin and thank you for reminding me of hope. That joy and sorrow are sisters. Nice to meet you Annie. Liked your FB page! Blessings to you! love the sound of this book! nice to meet you, Annie! what an amazing little epiphany He gave you--GOd is faithful to reveal Himself to us, isn't He? 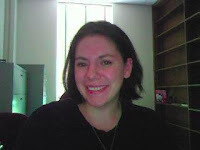 Jen, thought you may want to know that the linky isn't working--when i enter a pic from the web, most of the pics pop up blank, and when i back out and try to enter a pic from comp. file, it won't open to choose one. also having this problem on another blog--its been this way for a while--so im sure its an issue with Linky that may need to be reported? just wanted you to know. blessings to you this holy week, dear Jen! What powerful words! So nice to meet you, Annie! The book sounds amazing and I hope to see you in Austin! What a powerful ministry and witness this is. I have a good friend with a heart for the homeless in Austin too and wondered if you knew her: Kathy Palmer. anyway really good post - food for thought and for the spirit. Annie, this is powerful, simple & yet so very profound. Thankful for you, your ministry and partnership with Jen in the upcoming SDG retreat! Although I will be unable to join you, I'm praying for it...also, I love the title of your book! It definitely draws in to amazing things to contemplate in the face of the homeless. the Lord's richest blessings on you BOTH! Sounds like a deep journey through Austin, Annie. Thanks, Jen, for introducing us. I am praying for your retreat, my friend. It sounds like it's going to be wonderful. Heading over to "like" Annie's page now! Hi Annie, your words are truly inspiring. I'm new here and really happy to have found this community. not sure how in the world I missed this- I am linking to you each week - maybe I did something wrong (not always good with buttons) :) God bless - I'll catch you this week for sure - love this linky!